As other Scoota users have already found to their dismay, the circuit-breaker that’s included with the scoota is not really up to the job of being – well – used with any frequency. I found this to my cost when I went on a fifteen mile return journey one freezing day in November, when the bike suddenly took to shutting down apparently at random. Opening the seat quickly revealed that the breaker switch had been tripped for some odd reason. After a certain amount of roadside experimentation, it became clear that no scary electrical overload had caused this to happen, just that the balance of the switch had become so delicately poised that any random event (or even nothing at all, apparently) would just cause the switch to shut off. 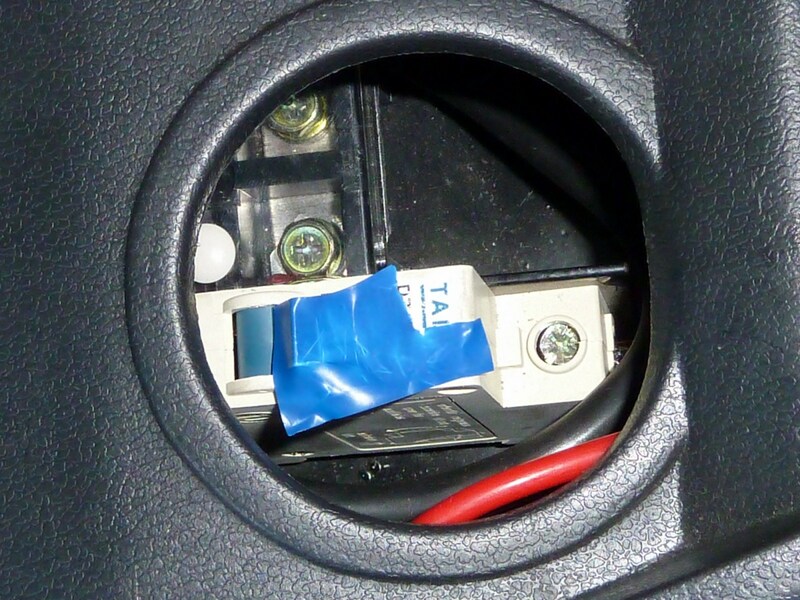 I improvised a quick ‘repair’ by wedging some folded napkins under the seat where it would continuously apply pressure to the switch, and then – later – used some insulation tape to bodge it open while I was using it. Eventually, of course, I would have to replace it, which is not great expense, but it would mean taking the whole bike apart to get at it, which I’m not yet ready to do. The problem is that the isolator switch is exactly the same type as one you will find in your domestic ‘fuse-box’, and on the face of it this seems like a perfectly reasonable choice of component to do the job. 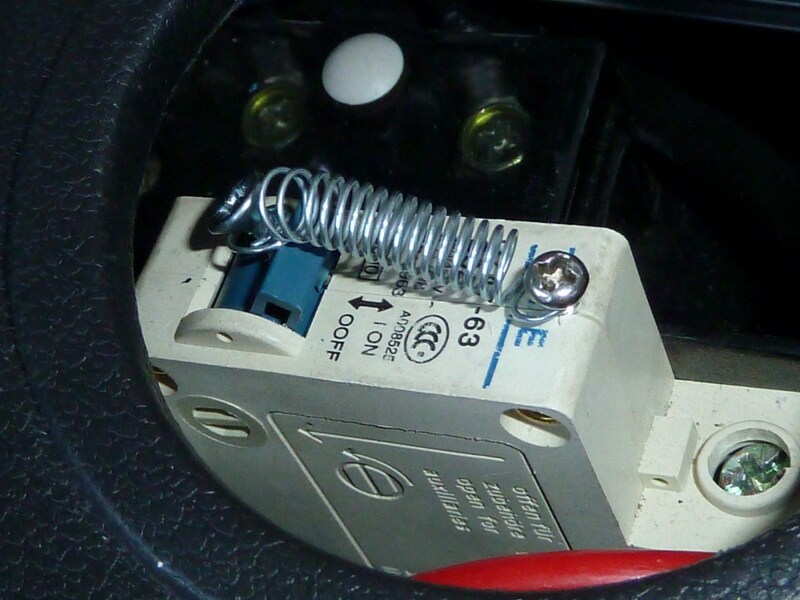 However, while, the breaker-switches in your fuse-box often sit for years without ever being used, it is common for scoota riders to switch their bike ‘off at the mains’ when it’s standing idle for any length of time, or even – in my case – when I have it stored in my unit overnight. Recently, though, the switch has deteriorated further, and the insulation tape workaround wasn’t cutting it anymore, as the switch was gradually plying the tape loose. So I’ve come up with a superior type of bodge consisting of two little screws set into the breaker switch and its body, which are then connected by a little spring I got from a hardware store. The screw on the switch is big enough to properly secure one end of the spring to the switch, while the other, smaller screw allows me to hook and unhook the spring whenever I need the switch to be firmly held in the ‘on’ position. Eventually I’ll try and get hold of a ‘heavy-duty’ replacement that can be relied upon not to wear out within six months, but until more hospitable weather arrives, I’ll content myself with this. It should be stressed, then, that this is not a permanent solution. If you choose to do this, then I recommend that – as a precautionary measure – the breaker stay switched off while the bike is not in use! You are currently browsing the Zenid's Ego Scoota Blog blog archives for January, 2011.